"The Only Calibers You Need"
Home"The Only Calibers You Need"
I recently sold off my last revolver. A very sweet 2.5” barreled S&W 19-4 .357 Magnum. This means I have divested myself of all my .38 special and .357 ammo, allowing me to pare down the calibers I need to stock. This presented me with the perfect opportunity to talk about what ammos I do keep around and why. The ubiquitous rimfire round has plenty of reasons to keep it handy. It is still cheap to shoot, the guns that shoot it are cheap, it is a great intro or beginner level cartridge. The .22LR is a great small animal round, target round, substitute training round, and is awesome in a gun with a silencer. But the real reason to keep the .22 around is fun. The .22 Long Rifle is just fun to shoot, even without a suppressor. No recoil, low noise, low muzzle blast. Perfect for the beginner or the veteran shooter. The .22 LR deserves a spot in every arsenal. At the opposite end of the spectrum from the diminutive .22 we have the massive 12 ga shotgun round. The shotgun is probably the most versatile gun invented. It makes for a great bird hunting gun, it works for deer, pigs and even people. The 12 gauge shotty has served duty as an anti personnel weapon since its invention, which is why it makes a great home defense firearm. One gun can do just about any job with the correct application of barrel and shotshell. 12 Gauge shotshells are plentiful and relatively cheap, even the good personal defense stuff. But the versatility of the 12 gauge gives it a permanent home in my arsenal. Every arsenal should have at least one handgun. The handgun is the most convenient firearm to have at hand. For home protection or for concealed carry you need a handgun in a duty caliber. Realistically any of the logical calibers, .40 S&W, 9mm or .45 ACP will do. With modern ammunition you cannot go wrong with any of them, but the 9mm is the cheapest to shoot, the least recoiling and 9mm handguns hold the most ammo. This makes the 9mm the best choice in a handgun round. The 9mm also can make for a fantastic target gun too. The Russian AK round is probably the most popular rifle round in the world. For good reason; It is cheap and it works. That is why I have it in my arsenal. If you need to poke holes in stuff and/or shoot an intermediate cartridge on the cheap, there is no beating the 7.62x39. The guns that shoot the caliber are cheap too. SKSs and AK-47s are still relatively inexpensive guns to own. The 7.62x39 also makes a very decent hunting round with the proper choice of bullet. The little round is very similar to the ubiquitous 30/30 WCF ballistically, and if you hand load you could even make it a poor man’s 300 BLK with heavy projectiles and subsonic loads. At $.22 a round the 7.62x39mm is a fantastic choice. The .223 Rem may be the best intermediate rifle cartridge, and the AR-15 is easily the best rifle for home defense or duty. Both deserve a spot in every shooter’s toolbox. The 5.56x45mm is very versatile, from 45 grain varmint pills to 77 grain long range target bullets, this caliber offers a wide range of easily obtainable loads. The ever increasing popularity of the AR-15 means that plinking ammo and fancy hunting loads will just get cheaper in the future. So whether you are shooting bad people down the hallway or paper at 600 yards, this cartridge may be the best choice. The .308 Win may not be the best long range target cartridge, but it is a pretty darn good one and it is the cheapest. It is certainly the most available. 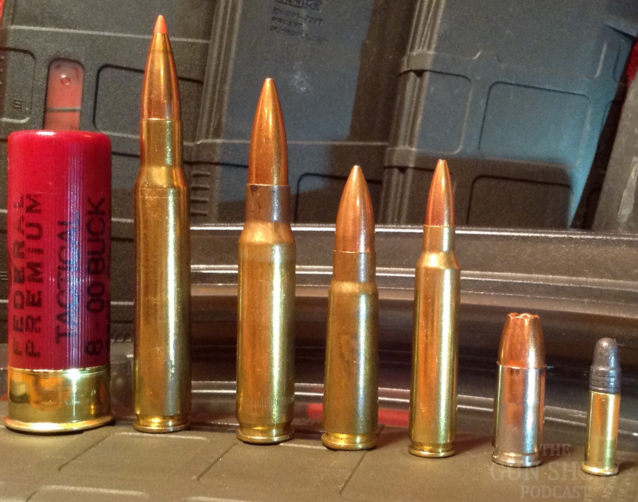 The 7.62x51mm is easily the least expensive full power rifle cartridge (aside from the 7.62x54r). The 7.62x51 is also a fantastic hunting caliber. Another bonus is that the perfect rifle, the AR-15, is readily available chambered in .308. (They call it things like the LR-308 and AR-10, but it is a big AR-15). Subsonic ammo is even easily obtained for the 7.62, and if you have not tried subsonic .308 through a suppressor you are missing out. Ok. The old aught six is probably redundant. Please do not misunderstand me, the ‘06 is a fantastic and versatile cartridge. You can easily find 120 to 220 grain loads for the .30 Cal warhorse. Honestly the 30-06 Springfield does not do much that the .308 does not. Except 1903A3. And Garand. I have a soft spot in my heart and my gun safe for the 30-06, so I will keep it around for a bit longer. Especially considering they have fun matches for the Garand and 1903. And let’s face it; that is why I have guns. They are fun. So there are the cartridges in my arsenal. I can practice on the cheap, carry a gun, defend my home, shoot targets far away, defend my country and hunt anything in North America with my choices in ammunition.